Sometimes I just can’t be asked to do anything. Especially in a crazy hot Hong Kong summer day like today, last thing I want is to get cooked up in front of a hot stove. This dish is perfect for a day like this. It’s extremely simple since there’s not much cooking involved besides boiling some noodles and veggies, but still doesn’t compromise on flavors. This recipe, if I can call it a recipe, is based on everything I have in my cupboard and fridge. You can use any vegetables and nuts you have instead of what I listed. 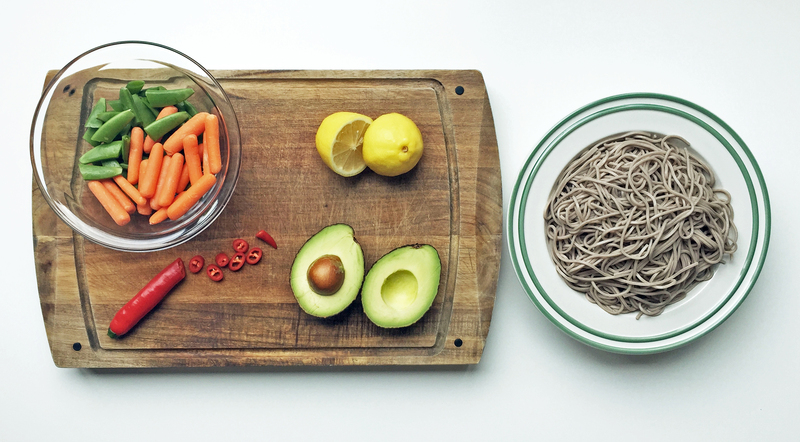 Just remember, you will want something crunch with your soba. Cook 200g of dried soba in boiling water for 4-5 minutes. Mean while, prepare a bowl of ice water. When the noodles are cooked, drain and thoroughly rinse them in cold running water. Place them in an ice water bowl and leave to cool in the fridge. Cook sugar snap peas and baby carrots in boiling water for 2 minutes. When they are ready, drain and place them in cold water. Cool them in the fridge for a couple of minutes. Mix all the ingredients for dressing and set aside. Peel and slice avocado. Halve sugar snap peas and carrots (lengthwise for carrots). 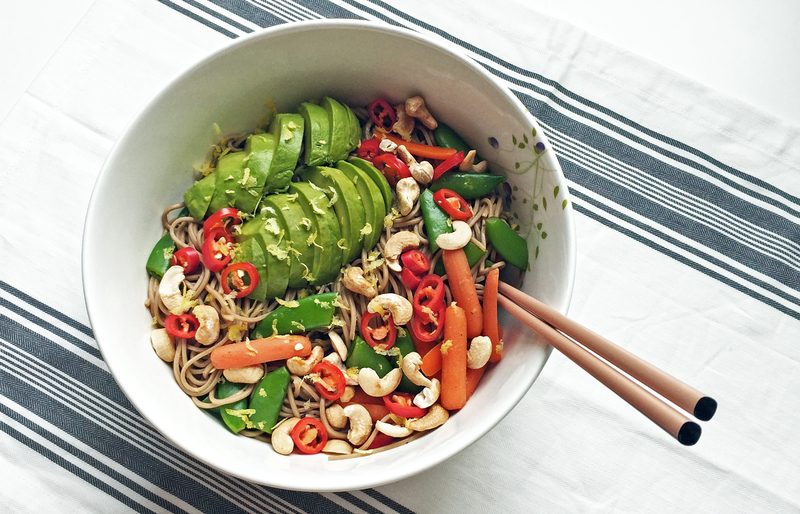 Mix dressing and vegetables into cold soba. 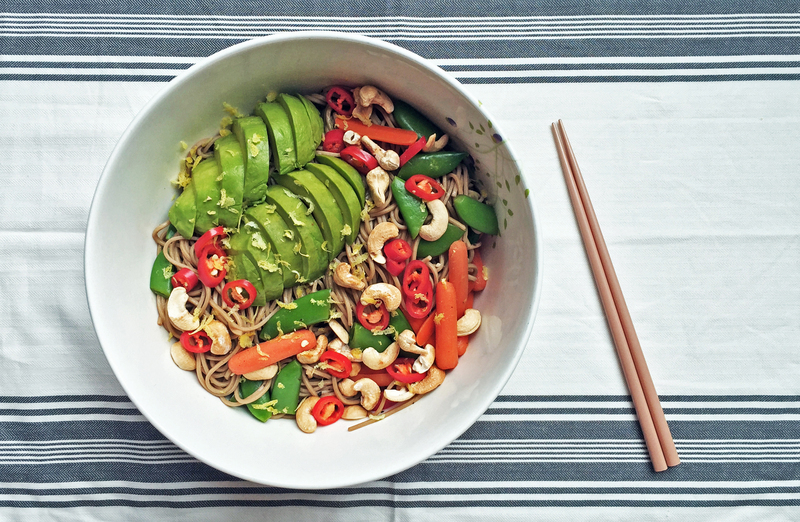 Add avocado slices and roasted cashew nuts. Lastly sprinkle some lemon zest and chopped red chili on top. Serve it cold.